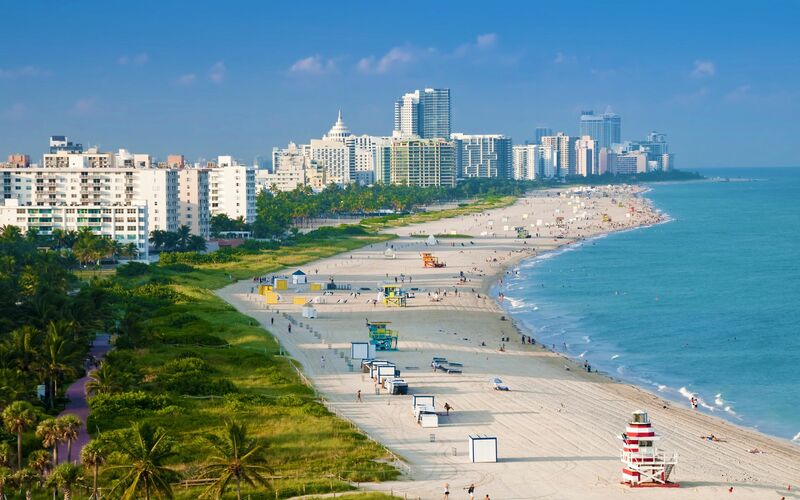 From Aventura to Key Biscayne the winter months in Miami Beach area are covered in white…..from the miles of sun-soaked beaches that is. Though snow doesn’t fall in South Florida, there is fun for all ages. Sunny Isles, Bal Harbour, Miami Beach, and South Beach all sit along the Atlantic Ocean inviting visitors to their pristine beaches and 75-degree waters. Just across Biscayne Bay Downtown Miami, Coconut Grove, and Little Havana are bustling with various weekend that meld cultures into one. So for a change of pace from falling snow and temperatures in the forties, consider Miami for an upcoming winter getaway. Tours around the Miami area are as diverse as the culture itself. 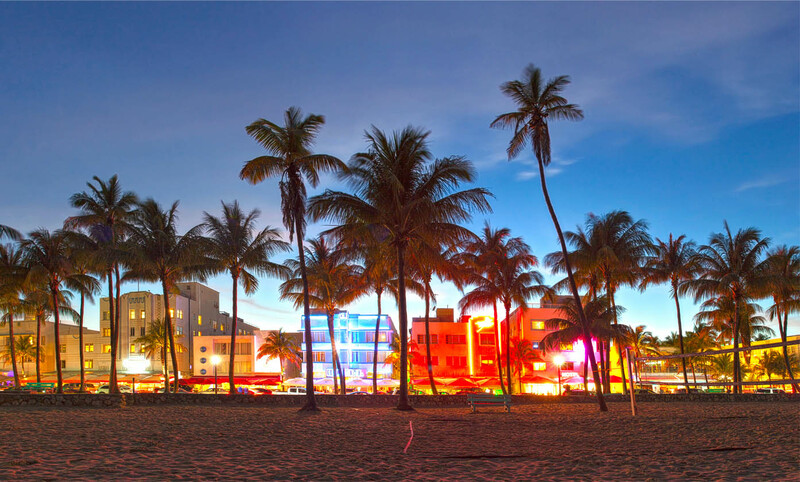 Whether strolling through the Art Deco District of South Beach, enjoying the beauty of the Miami Beach Botanical Garden, or experiencing the tastes of region with the Miami Culinary Tour, this slice of paradise is sure to have you quickly forgetting about the snow and cold back home. 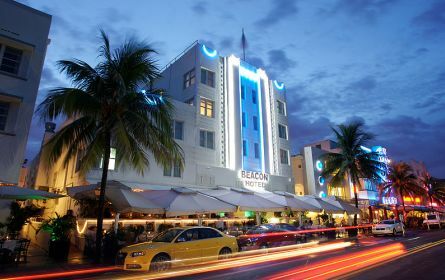 Along Ocean Drive is the historic Art Deco District of SoBe (South Beach). The architecture is timeless, the names iconic, and the history behind each building is fascinating. From The Clevelander to The Carlyle the beauty of the area screams SoBe! Just a few blocks from the Atlantic sits a quiet and serene setting known as the Miami Beach Botanical Garden. Open during the daytime hours, this 2 ½ acre area of greenspace offers a retreat from the hustle and bustle of the city. Built in the 1960s and refurbished in 2011, the Miami Beach Botanical Garden is home to many native plants and flowers such as the palms, cycads, and orchids and many others. Whether you’re in Miami for the first time or making a return visit, a ‘must do’ is booking an afternoon or evening with the Miami Culinary Tour. 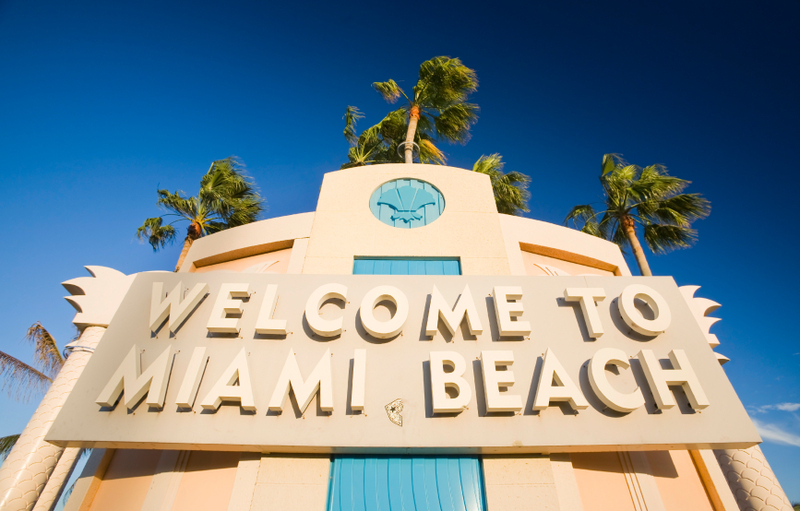 On a recent visit to Miami Beach my daughter, Morgan, and I were given a walking tour through the streets of South Beach with more than a half-dozen stops at some of the area’s finest restaurants. Mirka was our energetic and informative guide for the Miami Culinary Tour, and shared with us the history, culture, and even gossip of SoBe. Our 3-hour tour (nod to Gilligan) included tasty samples of authentic empanadas, ceviche, churros, and gelato. All of these locations aim to help make your stay that more memorable. While northerners may be skiing the slopes or sliding down Grandpa’s hill during the winter, those guests to Miami can kayak the waters of Oleta River State Park or soak in the sun on the miles of beaches along the Atlantic Ocean. Nestled in North Miami is the Oleta River State Park. From the moment you arrive it’s hard to remember that you are in the middle of one of the busiest cities in America. 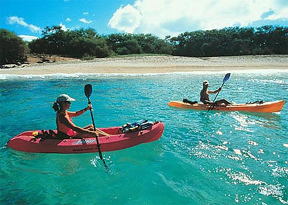 The Oleta River State Park offers kayak and canoe rentals through the mango trees and even mountain bike rentals through several trails of various skill levels. Imagine kayaking on Biscayne Bay instead of fighting snowplows? After an enjoyable day at the park maybe grabbing a few hours of the fading winter sun on the sands of Miami Beach is just what the doctor ordered. From Sunny Isles to South Beach, and then Key Biscayne and Coral Gables, the Miami region has miles of beautiful sand beaches. Miami is packed with fantastic stores and boutiques. From the Aventura Mall located in the northern part of Miami to the open air market-like experience of Lincoln Road, guests and locals always find unique shopping and a variety of restaurants to enjoy throughout the Miami region. Entertainment is nearly non-stop in Miami. From the hundreds of clubs and pubs to world class entertainment, there is always something going on in and around South Florida. The NBA’s Miami Heat and NHL’s Florida Panthers will all be hosting home games during the winter months and into the playoff drive of the spring. 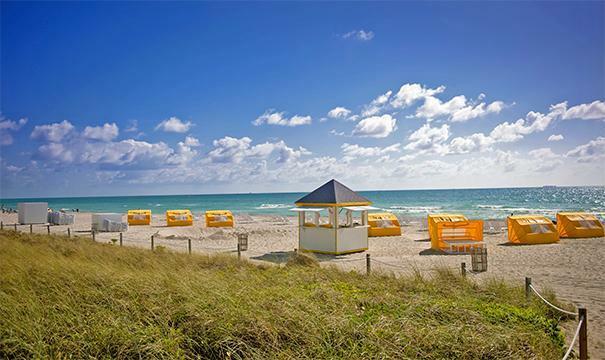 So think about putting the parka away and start digging out that swimsuit from the back of the closet, Miami Beach awaits you with warm temperatures, sunny skies, and friendly locals to help you forget about the winter season. Golfers all around the world are constantly looking for that newest golf ball to give them added distance or that latest club to give their game confidence and control. Walk into any sporting goods store or browse golf items on Ebay and you will see that there are dozens of tools and gadgets to make your golf game that much more enjoyable. Like the ball retriever or the adjustable loft iron, many of these items come and go as fast as a Tiger Woods tee shot. However, over the last few years course GPS and range finders have made incredible leaps and bounds, both technologically and price-wise. The neatest thing about many of these new items is that they’re available on your Android or iPhone. Golf Logix– This free app is able to be used on just about any smartphone and boasts nearly 35,000 golf courses in its library. This app not only provides you with accurate tee to pin distance, but it also has features that will give you distances to hazards or lay up locations. One of the neatest things about this Golf Logix app is its “fly over” feature. One touch of your smartphone and you get to see a tee to green birds-eye view of the hole you’re about to play. This feature is extremely helpful when playing a new or unfamiliar course. Golf Logix also has built in features to allow for not only scorekeeping, but shot by shot record keeping and even post-round video lessons on the areas your game needs work on. Golfers can even book future tee times at thousands of courses through Golf Now on the Golf Logix app, with daily updates and discounts. 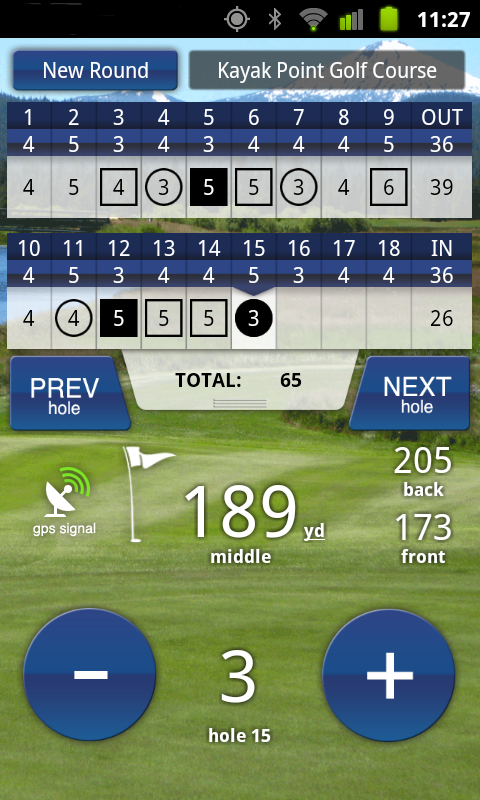 It’s pretty obvious why over 3 million golfers have chosen this app as their go-to golf app. Swing By Swing- This golf GPS range finder and scorecard ups the ante a bit on other golf apps by also offering wind speed and direction on every hole. 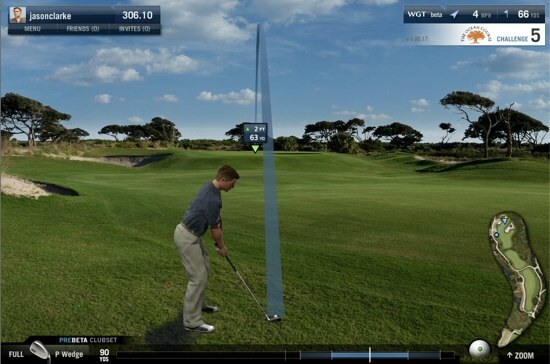 The unique “Plays Like” feature takes into consideration wind and elevation to give the golfer a more realistic distance that the ball needs to carry. Claiming to have every golf course in the world in its library (by the way, I didn’t check each one) Swing By Swing also offers a website community where golfers can share theirs scores, stories, and even pictures from their round. The scorecard feature not only keeps track of every stroke entered, but will also help organize various betting games such as Skins, Stableford, Nassau, and more. Swing By Swing is free for life and available for download on most platforms. Golf Pad GPS– Don’t be fooled by it’s name, this handy little golf caddy is available for smartphones as well as iPads and tablets. Featuring over 30,000 free golf courses, Golf Pad GPS has taken the best features from the industry’s top apps and made them even better. The GPS range finder gives distances to the front, middle, and back of every green, while also giving distances to course hazards. The 4-players scorecard tallies the shots, putts, and even penalties of every player playing in the round. Hole by hole fly overs, round by round playing history, and accurate game-improving statistics are just some of the reasons why Golf Pad GPS is quickly gaining in popularity in the free golf app category. And by the way, if you find a course that this app doesn’t have a simple visit to their website allows you to map the course in about 20 minutes. 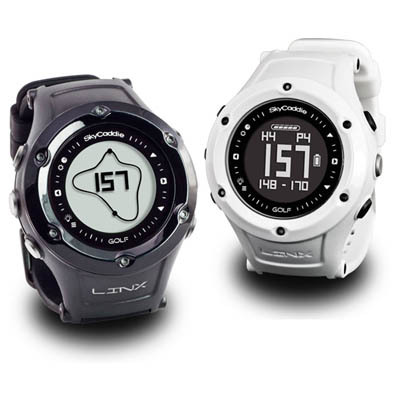 SkyCaddie LINX Golf GPS Watch– For those not wanting to constantly be fidgeting with their smartphone while playing golf, one of the GPS industry leaders, SkyCaddie, has introduced its new Golf GPS Watch. While this isn’t designed to have all the colorful bells and whistles of the smartphone apps, it does get the job done unite well. For around $150 this versatile and sporty watch can be worn on and off the course. It features not only the time, but also a built in odometer which users can then download onto their own profile on the computer. With regards to the GPS range finder feature, this SkyCaddie watch gives a large display of the distance to the front, center, and back of the green. Distances to various hole hazards can also be displayed with a click of a button. This watch is water resistant and durable. It comes with a rechargeable lithium ion battery and includes mini-USB cable for charging. For me, this SkyCaddie Golf GPS watch could be my next acquisition. A simple glance to the wrist will provide me with more than my next golf shot will need. World Golf Tour (WGT)– For those days when your golf game gets rained out WGT comes to the rescue. Escape the local thunderstorms by playing a round at historic St. Andrews, Pebble Beach, or any other spectacular course around the world. World Golf Tour is truly the most realistic online golf game ever. This virtual golfing world allows players to connect with one another and play amazing golf courses regardless of the weather outside, day or night! Whether you play from your computer, smartphone or tablet, WGT offers realistic play which even the pros have claimed adds to the improvement of your golf game by working on your course management and decision-making skills. World Golf Tour simply requires a one-time sign up (username and password) and within minutes you’re playing with friends that you’ve invited in, or others from halfway around the world. Remember that while these golf apps and gadgets are on the cutting edge of technology and offer never before applications for one’s game, nothing will ever replace the need for practice, play, and the occasional lesson from a PGA professional. But with that being said, those looking for a slight competitive edge, or just some plain fun to add to their game, the download of any of these five will surely not disappoint the inner Jack Nicklaus or Natalie Gulbis in all of us. Welcome to my hometown- Oswego, NY. We may get winter snow, but it is beautiful otherwise. Throughout the northeast, Summer is always welcomed with open arms, ready-to-spend wallets, and a desire to wear bathing suits whenever and wherever possible. With its four distinct seasons, from Memorial Day to Labor Day those in the New York State area attempt to squeeze every available sun-shining moment into their schedules. 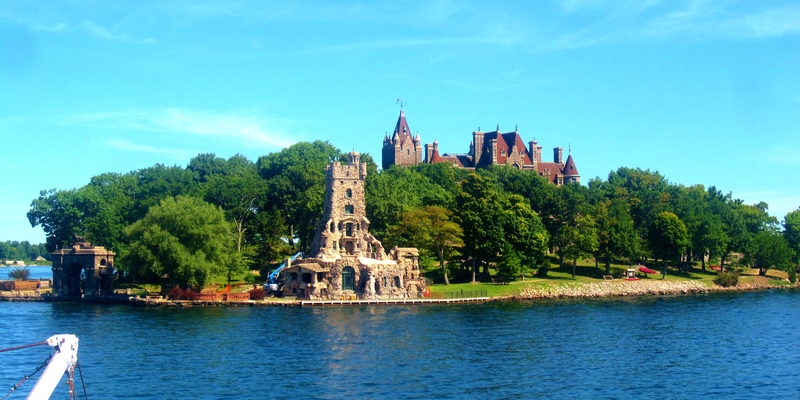 So without further delay (because I think the sun is coming out to stay), here are some ideas I’d like to share with you for your summertime fun in and around New York State. In Syracuse, Saturday mornings are reserved for hundreds to pay a visit to the Regional Market. Now this is open nearly all year round, but it’s a nice way to spend a summer Saturday morning as you stroll through locally grown fresh fruit, vegetables, and flowers. The Regional Market is open until 1pm on Saturdays. My wife and I usually start our Saturday out that way a couple of times during the summer. From there we head a few miles to the south, to the Armory Square district. This section of Syracuse boasts several restaurants, quaint pubs, along with specialty stores and boutiques. You can typically catch us enjoying lunch and a pint at The Blue Tusk. One of the largest attractions found in Syracuse when it’s not SU Orange basketball season is a trip to Destiny USA. Filled with hundreds of well-known stores, restaurants, and attractions, Destiny USA has something for everyone. Besides hours of shopping, this mega mall has indoor simulated golf, go-cart racing, comedy clubs, and museums. Popular eateries at Destiny USA include the Cheesecake Factory, Cantina Laredo, PF Changs, and Gordon Biersch. 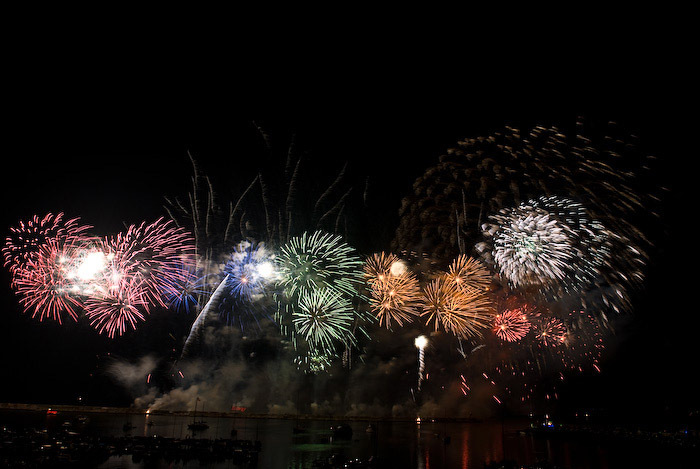 During the last weekend in July the City of Oswego shows off its Lake Ontario lakefront beauty with its Harborfest celebration. From Thursday to Sunday the city is transformed into a carnival atmosphere, mixed with great food, second-to-none free concerts, and traditionally Chamber of Commerce weather. Whether you want to taste regional wines, buy locally created crafts, take in a concert from top name acts, or just appreciate how lucky Oswegonians are to live alongside Lake Ontario, Harborfest weekend is a date you don’t want to miss. Speaking of wine tasting, Central New Yorkers are blessed to have some of the world’s finest wines within a short drive. I enjoy taking a day, or sometimes even a weekend, to skip from winery to winery between Cayuga and Seneca Lakes. Part of the Finger Lakes Wine Trail, these wineries have fun employees, great tasting wines, and many now have overnight accommodations and restaurants. I prefer staying at The Inn at Glenora at the south end of Route 14 or Belhurst Castle, located at the north end of Route 14 in Geneva. Some of my favorite lunch and dinner locations are Fox Run Farms Winery (found on the west side of Seneca Lake), Stonecutters (located in Belhurst Castle), and Sheldrake Point (along the west side of Cayuga Lake). As far as wine tasting goes, I have my favorites, but wine tasting is like that of music or food taste- it varies with each individual. That being said if you haven’t experienced the Finger Lakes Wine Trail some must-see stops are Swedish Hill, Hazlitt’s, Bagley’s Poplar Ridge, Three Brothers, and Fox Run Farms. 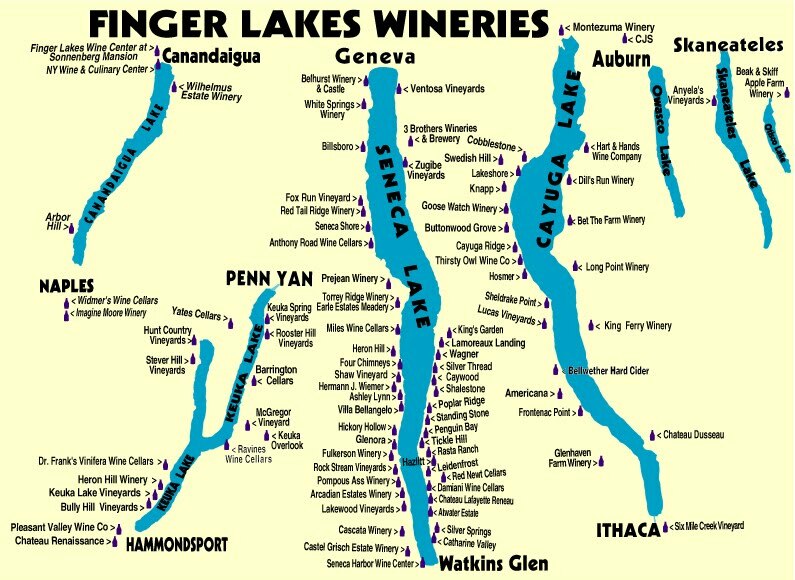 You can find great interactive maps and descriptions by Googling ‘Seneca Lake Wineries’ or ‘Cayuga Lake Wineries’. More family-oriented travels may see you spending the day at Rochester’s SeaBreeze Amusement Park, along Lake Ontario or the Darien Lake Amusement Park, located midway between Rochester and Buffalo just off the Thruway. Located in Sterling, NY (near Fair Haven Beach State Park) is the Renaissance Faire. Open for the months of July and August, the RenFaire takes visitors back to the Middle Ages with jesters, joustings, and the beloved fried turkey legs. 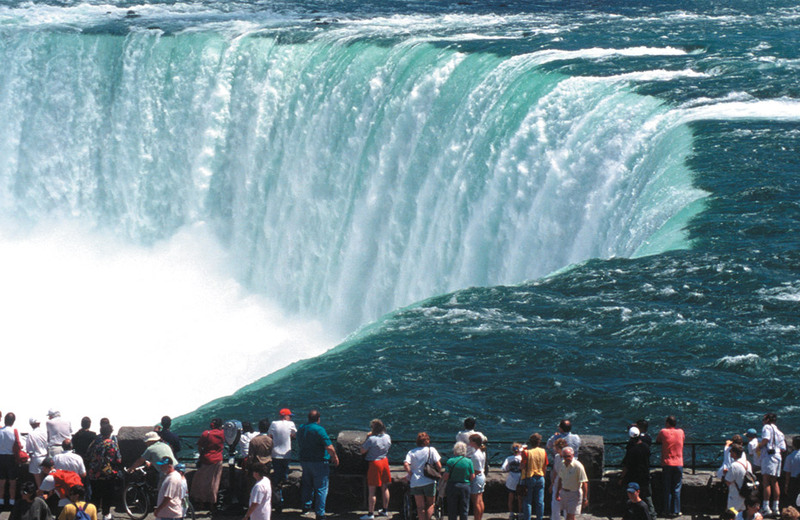 If you have a weekend or a few days to spare, expand your travels to Niagara Falls. Whether you stay on the U.S. side or venture to the Canadian side, one of the great wonders of the world never disappoints. (Remember- a passport in now needed when traveling to Canada.) Besides that big waterfall that everyone goes gaga over, both countries boast casinos and plenty of entertainment. On the Canadian side they have the famous Clifton Hill, otherwise known as the ‘Hill of Fun’, with restaurants, attractions like Ripley’s Believe It or Not museum, and the Hershey Chocolate store. Of course don’t forget an unforgettable ride on The Maid of the Mist, as you get closer to the falls than you ever thought imaginable. Also over the border sits the City of Kingston, Ontario is a great weekend getaway! This quaint Canadian city offers tons of food and shopping along its famous Princess Street and Ontario Street. Heading into the northern part New York, one fun stop can include Lake Placid, with a trip to the summit of Whiteface Mountain mixed in with a casual walk down their wonderful Main Street along Mirror Lake. Bobsledding in the summer is possible at the Olympic training center located just outside Lake Placid. Back in NYState are the Lake Ontario towns of Alexandria Bay, Clayton, and Sacketts Harbor. All are perfect for that much needed day-trip. Whether traveling by boat or car, these lakeside towns offer breathtaking views, fun shopping, and a variety of restaurants and taverns. If you feel like traveling a little to the southern part of the state, a great day trip or weekend getaway can be found in Cooperstown. Known of course for its Baseball Hall of Fame, Cooperstown also is home to the Farmer’s Museum, Fenimore Cooper art museum, and the Leatherstocking golf course alongside the historic Otesaga Resort. If horse racing is more your guilty pleasure, check out Saratoga. 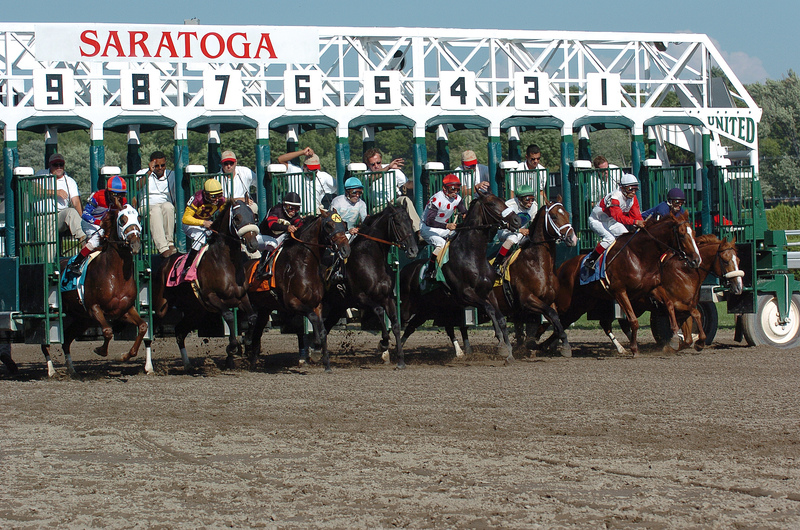 During the summer months Saratoga comes alive with thoroughbred horse racing and an atmosphere of yesteryear. Saratoga is also home of SPAC (the Saratoga Performing Arts Center), which brings in top name talent in the music industry for great concerts in a perfect setting. Of course NY City is always a fun place to make memories. Whether strolling along along Broadway or taking in views at the top of the the Empire State Building, the Big Apple is loaded with great attractions, incredible shopping and one-of-a-kind food options. On the first Saturday of May the horse racing world converges on Louisville, Kentucky for the running of the Kentucky Derby. Though the race only lasts a little more than two minutes on that Saturday, tens of thousands call Louisville home for weeks leading up to Derby Day. 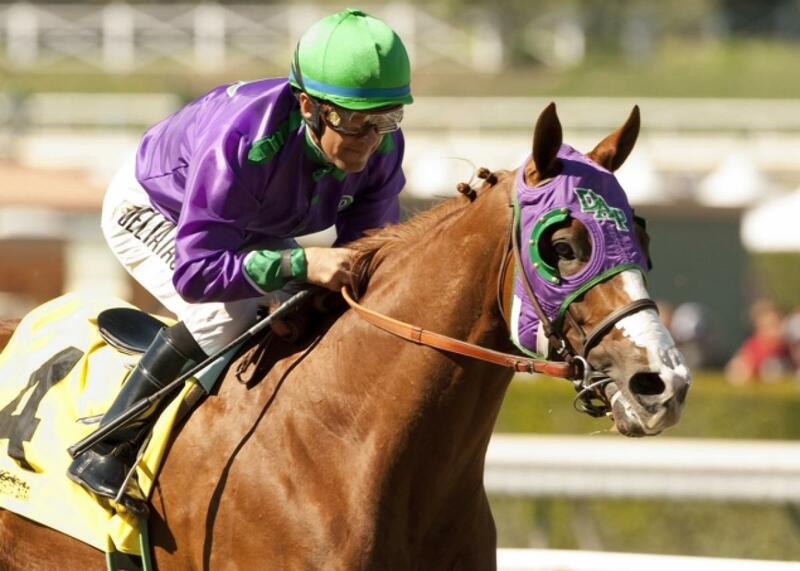 Here are some events and places to visit if you plan on visiting this horse racing mecca. Held at the Waterfront Park along the Ohio River, this festival has a little bit of everything. From beer gardens to rows of food vendors, helicopter rides to free concerts, Fest-a-Ville and Chow Wagon continue to grow in popularity each year. This year’s highlight of Waterfront Jam is a Friday, May 2nd concert featuring country artists Scotty McCreery with special guest Cassadee Pope. Horse race? Did someone say something about a horse race? Held in downtown Louisville since 1956, this family-oriented event is filled with marching bands, inflatable characters, and of course “horses”! Running along Broadway between Campbell and Ninth Streets in the heart of Louisville, the Pegasus Parade is the longest running Kentucky Derby Week event. This year’s parade is on Thursday, May 1st. Traditionally held the day before the Kentucky Derby, “The Oaks” celebrates the finest three-year fillies in the thoroughbred world. Lilies and the color pink highlight this prestigious race to honor and celebrate women and breast cancer awareness. Tickets for this day long event can be obtained in advance from the Kentucky Derby website or the day of the race at Churchill Downs. “The Run for the Roses” will take place on Saturday, May 2nd this year. Gates will open at 8am with tickets available online ahead of time or at the gates the day of the race. 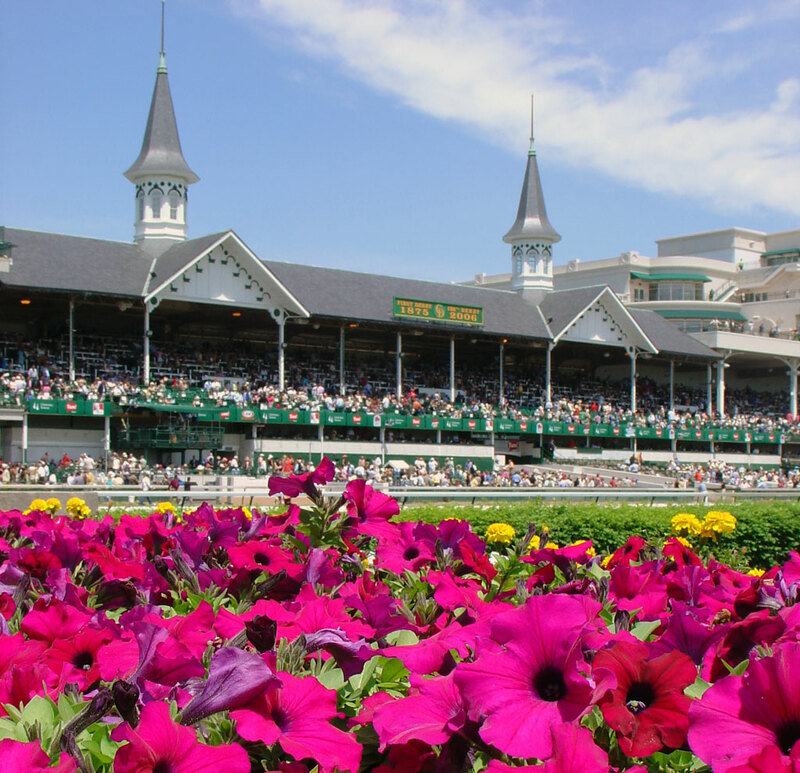 From dedicated horse race enthusiasts to well-known celebrities, the stands, infield, and rail of Churchill Downs will be packed with mint julep-sipping fans excited to be part of “the most exciting two minutes in sports”. With thousands women wearing stunning (and outlandish) hats, the playing of “My Old Kentucky Home”, and the garland of roses for the winning horse and jockey, the Kentucky Derby is filled with tradition and pageantry. Though it is known as the Home of the Kentucky Derby, Churchill Downs is also the location of the Kentucky Derby Museum. Often referred to as “the next best thing to being at the Derby”, the Kentucky Derby Museum is filled with memorabilia and artifacts from years gone by. And not only does Churchill Downs celebrate its past, but it is excited with nearly 75,000 square feet of new and renovated grandstand space along with a new $12 million outdoor, state-of-the-art video board. This iconic factory has turned into more than just baseball bat making facility. From the moment your walk up to the front of the building, the six-story high, 68,000 pound bat welcomes you to what will surely be a memorable experience. This hands-on museum contains baseball memorabilia galore and artifacts from the sports such as Babe Ruth’s bat the he hit his last homerun with as a Yankee. Visitors can even have their own personal bat made for them during their stay. The factory and museum is open seven days a week with admission only $12 for adults and $7 for kids 6-12 years old (Under 5 yrs old are free). Keeping with the baseball theme, Louisville Slugger Field is home to the minor league baseball team named——-wait for it——- “The Louisville Bats”. Even if you’re not a big baseball fan, there is fun to be had at all home games, especially Thursday home games which feature $1 beers and live music throughout the game. This Triple AAA farm team of the Cincinnati Reds plays in front of nearly 14,000 fans each home game. Open all year round, the Louisville Zoo is so much more than a place to go and see the animals. Featuring Sky Ropes and Sky Tykes for kids, this series of rope trails take participants over the zoo visitors below. 5K run/walks, concerts, and kid camps are also offered throughout the year at this community zoo. With dozens of exhibits located inside and outside, animals like polar bears, tigers, penguins, and gorillas all call the Louisville Zoo home. What can only be described as ‘Magnificent’, the Louisville Mega Caverns are one of Louisville’s must-see attractions. Located just off Interstate 264, whoever knew you could have a day full of fun 100 feet underground? The MegaTram is an hour long tour through the nearly seventeen miles of cavern trails steeped in history, education, and fun. MegaZips is a different kind of tour through the caverns. It is a 2-hour long tour using zip lines and a registered guide. MegaQuest is an aerial rope course that takes visitors to places throughout the cavern they won’t believe. The Louisville Mega Caverns are capable of hosting birthdays, team-building, and other events up to 200 people. The historic area of Louisville known as Old Louisville is filled with rich architecture and history dating back to the late 1800s. Located north of downtown Louisville, this area has streets lined with classic victorian homes and neighborhood squares like St. James Court. 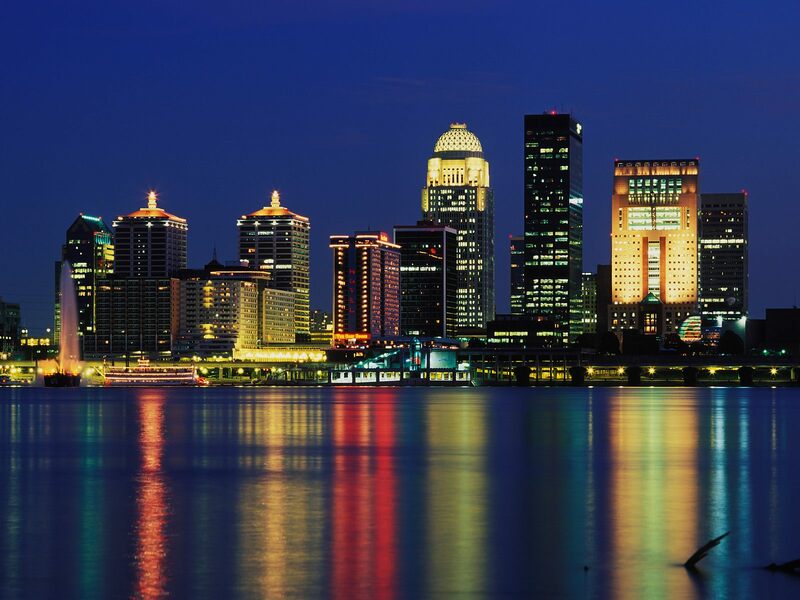 Being located between downtown and the University of Louisville has made Old Louisville a favorable place for relocation in the area. The museum’s Mission Statement just about says it all: “The mission of the Muhammad Ali Center is to preserve and share the legacy and ideals of Muhammad Ali, to promote respect, hope, and understanding, and to inspire adults and children everywhere to be as great as they can be.” This breath-taking facility was created to share with the world the life of the great boxer and humanitarian, Muhammad Ali. This interactive museum also hosts seminars, special community events, and educational programming. Many of the photos and memorabilia held in the Muhammad Ali Center are priceless, one-of-a-kind artifacts from “The Greatest”. When you are done sightseeing for the day, why not join a few thousand of your closest friends in the heart of Louisville? 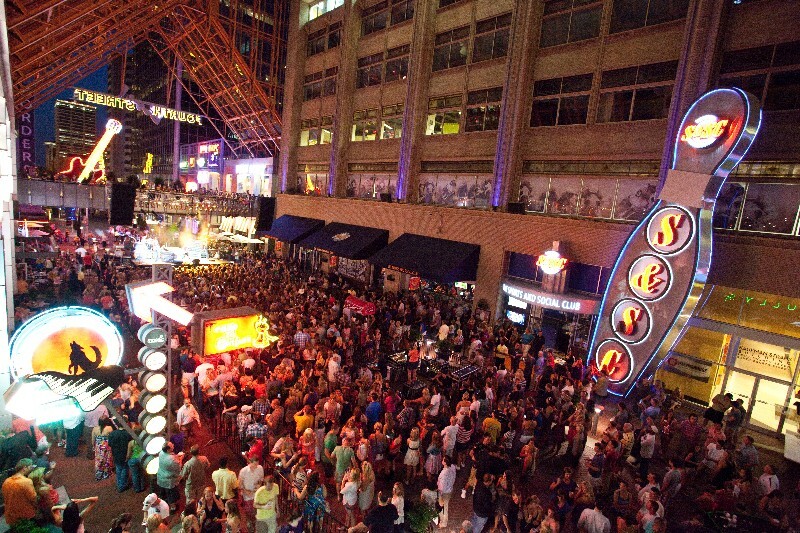 Fourth Street Live is conveniently located just a few blocks from the Ohio River in the middle of historic Louisville. Billed as your “one-stop destination for dining, entertainment, and shopping”, Fourth Street Live is packed with sports bars and night clubs, famous restaurants and name-brand stores, as well as live entertainment. Country stars Big and Rich will be performing on Thursday, May 1st, and Fall Out Boy will be in concert on Friday, May 2nd as part of Fourth Street Live’s Derby Week. The concerts are free for those in the area before 7pm, with a $5 cover for those arriving after seven o’clock. Whether you’re planning to be on the rail for the big race or just heading to Louisville for all the festivities, the town is ready for you. 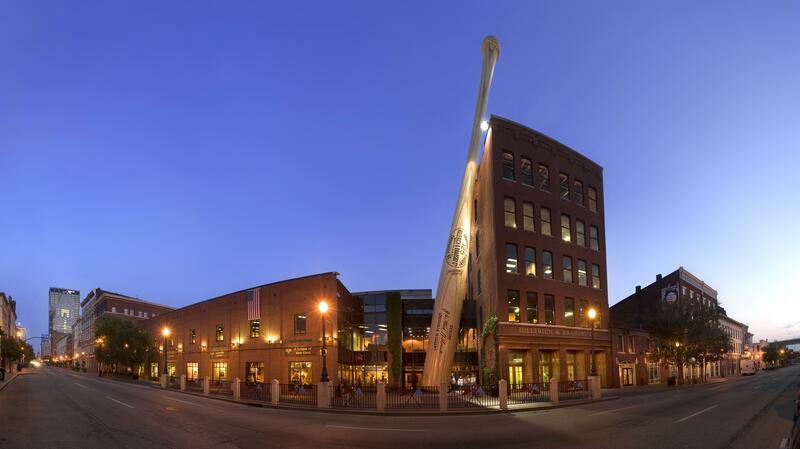 From zip lining through 100 foot deep caverns to taking a selfie next to a 60 foot baseball bat, the City of Louisville has events and attractions to keep you entertained before, during, and after the Kentucky Derby. 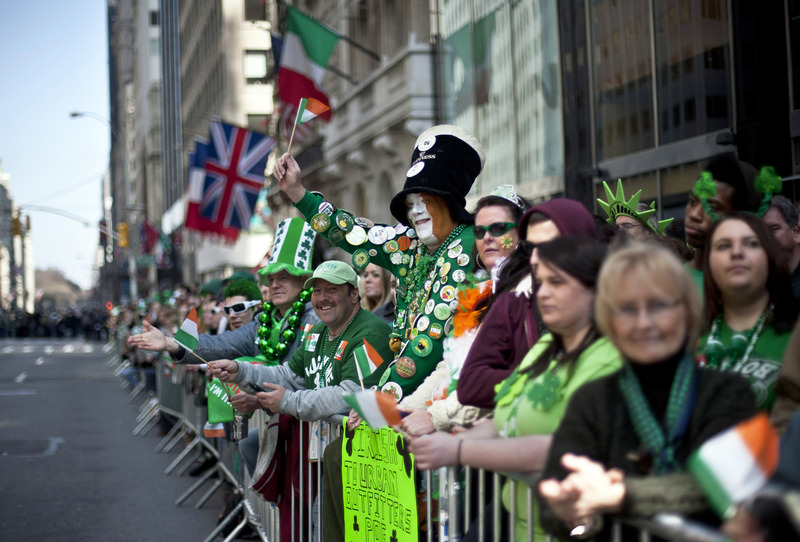 8 Great St. Patrick’s Day Celebration Cities in the U.S. When the middle of March arrives two things are a near certainty in the U.S.; one, winter is nearly over for most of the hearty souls living throughout the country; and two, everyone becomes Irish for a day (or in some cases, a week) for endless St. Patrick’s Day celebrations. 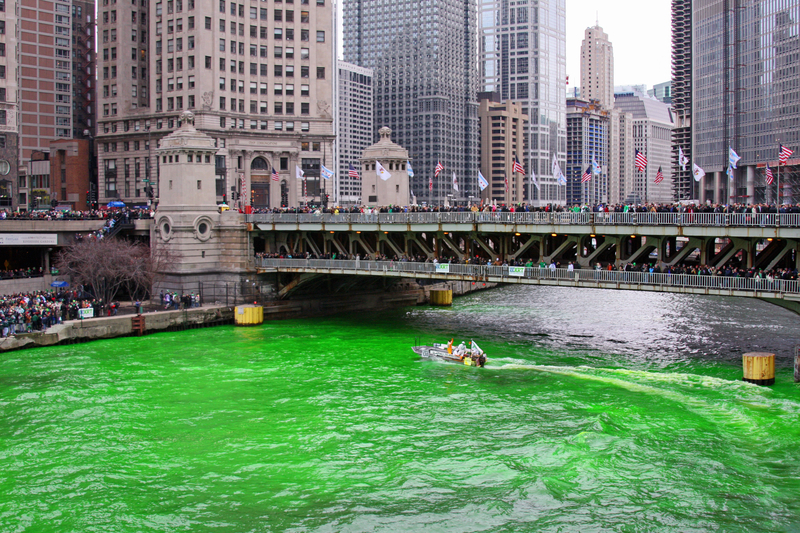 To help you “Get Your Irish On” here are eight of the hottest, craziest, tradition-filled cities and what they have planned for their St. Patrick’s Day celebration. if even for the day. 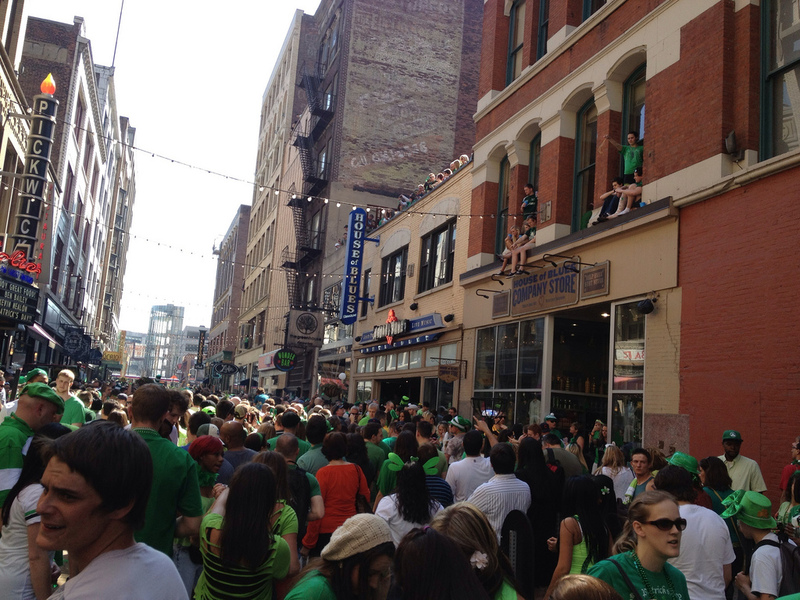 With its huge immigrant population, Cleveland has traditionally played host to a St. Patrick’s Day celebration to rival many cities even several times its size. Since 1867 Cleveland has hosted a parade, and this year promises to be no different, as nearly 10,000 participants will march through downtown Cleveland on Monday the 17th. Those who can’t wait to get their holiday started can head to one of two historic Cleveland watering holes known as Flannery’s Pub or Pickwick & Frolic for some breakfast and a pint. After the parade, those celebrating the “The Luck of the Irish” can stay in downtown and stop by Moriarty’s or the Flat Iron Cafe for tasty beer and great tasting corned beef and cabbage. Various types of Irish music will heard throughout the city of Cleveland through the weekend, as area pubs will provide entertainment ranging from traditional Irish folk music to rock. Though the west coast may not have the same history as its neighbors to the east, don’t be fooled; SanFran knows how to throw a St. Patty’s Day bash! Featuring its annual Irish Festival, local Pub Crawls, downtown Block Parties, and parade, San Franciscans have wrapped their Irish arms around this holiday. With U2 cover band, ‘Zoo Station’, playing nearly all of U2’s popular songs in a concert at the Brick & Mortar Music Hall and the ‘Emerald Across the Bay 12k run’ being featured across the Golden Gate Bridge, San Francisco promises something for everyone this and every St. Patrick’s Day. ages. Perhaps the best part of the festival is that all the music and activities are free. By the way, when viewing the parade, be sure to check out one of the more popular parts of it, as locals show off their decorated and suped-up golf carts cruisin’ down Ocean Blvd. Yeah, that’s what I said, golf carts. And I haven’t any beer yet. parade. And this year, in following with tradition, the parade is scheduled to be on Sunday, March 16th at 1:00pm. Beginning on Friday, March 14th revelers can begin a weekend of bar crawls, with several to choose from each day. One of the nice parts about these crawls is the free shuttle service called ‘The Erin Express’, which is runs all day through the City of Philly. Several concerts (some free) will be held throughout the city during the weekend along with neighborhood festivals and Irish dancers. St.Patrick’s Day parade scheduled to take place on Saturday, while Savannah’s parade is scheduled for Monday, March 17th. 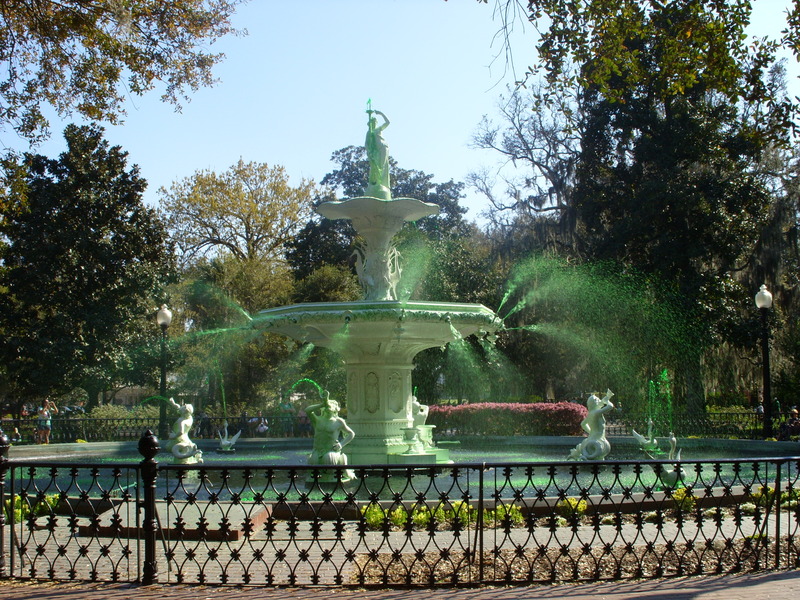 From the sandy beach of Tybee Island to the historic squares of Savannah, the hospitality of the South is on full display during its St. Patrick’s Day celebration. continue the afternoon of fun as revelers march up Columbus Drive. Those visitors to Chicago staying in ‘The Loop’ will be close to some of the best pubs Chi-town has to offer. Fun-filled pub crawls are found throughout the city and many establishments will feature lively entertainment. 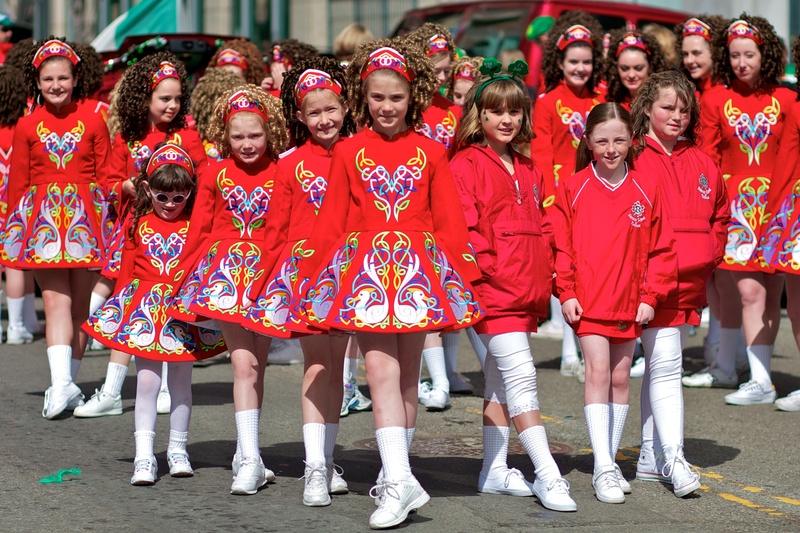 From Irish-step dancers to sight-seeing cruises along the Chicago River, guests to Chicago will non-stop fun during St. Patrick’s Day weekend. 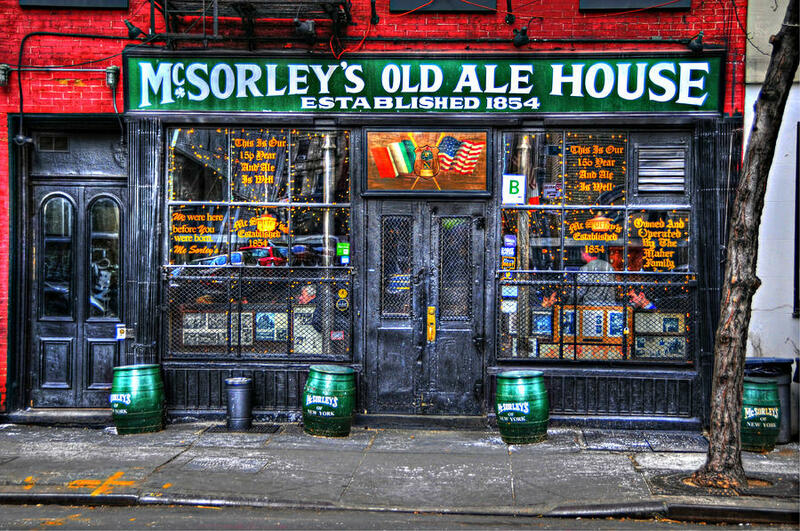 St. Patty’s Day partiers also feel a sense of, ummm, “responsibility” to visit NYC’s oldest bar on this celebration of everything-beer-holiday, and McSorley’s is the stop in the East Village. Note- that when and if you get into McSorley’s be ready to drink many beers, and fast. If the workers don’t feel you are up to their expectations, you will be asked to leave. (No joke.) Throughout the St. Patrick’s Day weekend, area neighborhoods will feature Irish festivals with the smells and sounds of authentic Irish food and music floating throughout the city. holiday. 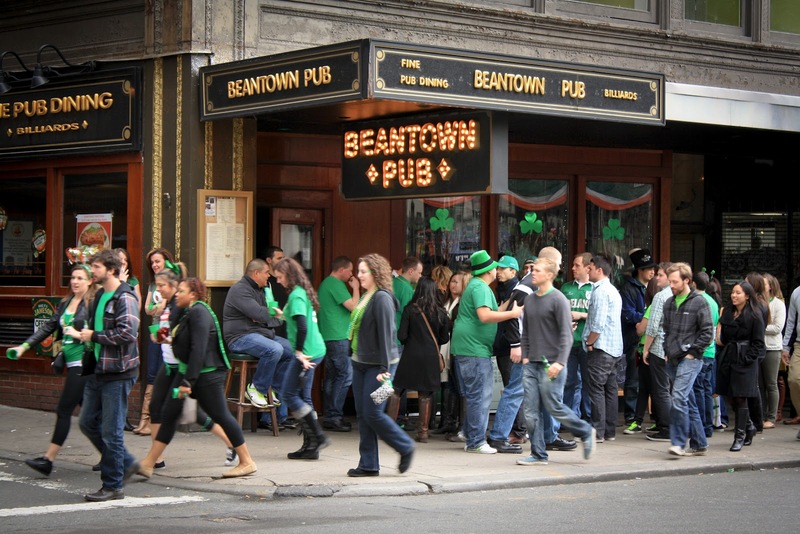 But make no mistake about it, these United States have town after town celebrating the Irish in their own unique way. From Dublin (Ohio) to the Home of the Fighting Irish, Notre Dame University, people love St. Patrick’s Day. 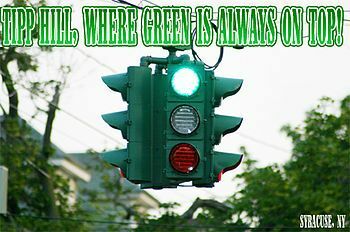 Whether a town paints the largest shamrock in the U.S. on a nearby Interstate and serves green eggs and ham for breakfast around town, like those in O’Neill, Nebraska, or a neighborhood that receives special permission from the Department of Transportation to permanently ‘flip’ a traffic light along a popular Irish street, so that the “green light is always on top” like those on Syracuse, NY’s Tipperary Hill, American’s love their Irish heritage like no other ethnic background. Of course if every ethnic group would include beer in their celebrations, think of how much fun we could have almost every weekend of the year! 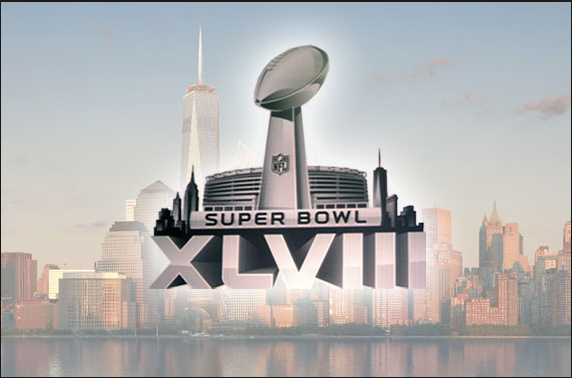 On Sunday, February 2nd the sports and entertainment world will be focused on the city of New York, as it plays host to Super Bowl XLVIII. Though the game will actually be played at MetLife Stadium in the Meadowlands, NJ (home of the NY Giants & NY Jets) much of the pre-game hoopla will occur on and around the island of Manhattan. Though activities and events began during the first week of January, most of the high-profile companies as well as the Super Bowl Committee itself will open their venues during the week leading up to the big game. The nice thing about “Super Bowl Week” is that even those who don’t have a coveted ticket to the big game can enjoy many of the free activities positioned around the city. And leave it to The Big Apple to have events galore scheduled leading up to the game. From shutting down Times Square to creating what will be known as the “Taste of the NFL”, NYC has entertainment covered for young and old alike. Here are some things to put into your planner if you are making your way to New York City during the last week of January and first weekend of February. The folks at Budweiser in recent years have taken over a resort or large hotel in the Super Bowl host city and declared it the Bud Light Hotel, as it threw a week-long party for contest winners and various guests. This year Bud Light has upped the ante and gone big, real big! Instead of taking over a hotel, the beer king will be bringing in a cruise ship and calling the USS Intrepid aircraft carrier home from January 30- February 3. 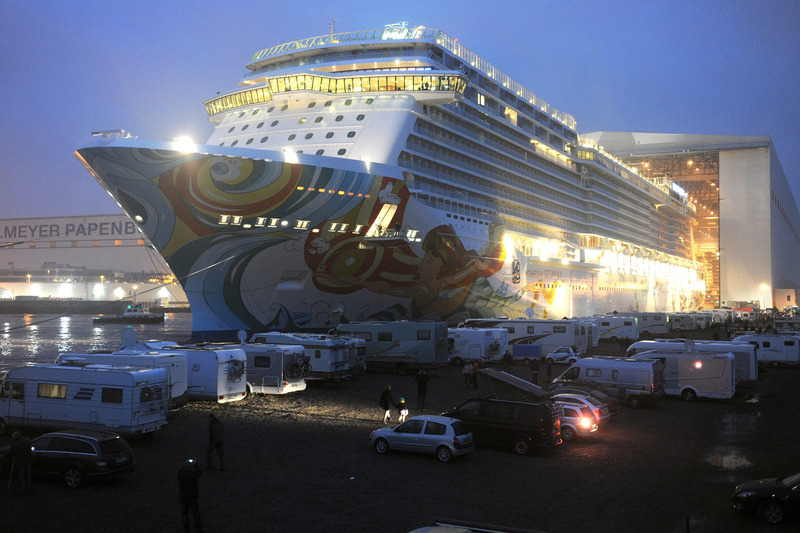 Located at the west end of 47th St., along the Hudson River, the Norwegian state-of-the-art cruise ship “Getaway” and US Navy icon will be the venues of meet and greets, concerts from top name artists, and over-the-top parties. Those looking to be guests in the “Super Bowl hotel” can take their chance at winning by downloading the FanZone app and taking it from there. Jersey City will host “Football Fashion Week” with established and rising stars in the fashion industry. Former NY Giant great Carl Banks will actually be on hand to feature some of his latest designs from his company, Gill Sports. Several former NFL players and entertainers will be walking the runway in this event running from January 23-25. For video game aficionados, The Museum of Moving Image will be the location in Astoria (Queens), as EA Sports presents an exhibition called “Madden NFL Football: 25 years and Running!” Visitors will be able to take in this interactive exhibit and see the evolution of one of the most popular sports video games of all time. Foodies Unite! 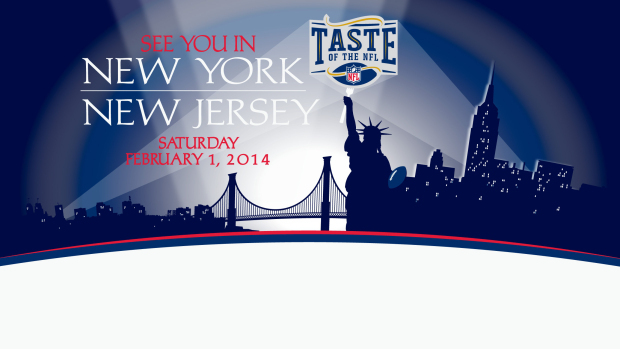 The “Taste of the NFL” comes to the Brooklyn Cruise Terminal Pier 12 on Saturday, February 1st. This “foodfest” event will feature a chef from each NFL city serving their signature dish, alongside a current NFL player or legend. So bring your hungry tastebuds and a camera for this unique celebration of sport and food. Visit http://www.TasteOfTheNFL.com for more information and get tickets. The Prudential Center in Newark, NJ will host the Super Bowl XLVIII Media Day on Tuesday, January 28th. Tickets must be purchased prior to the day of the event at SuperBowl.com, and the event will begin at 10:30am with seats reserved. At Chelsea Piers- Pier 60, The NFL-Celebrity Bowling Classic will take place on Saturday, February 1st. Amateur bowlers will be teamed with NFL players, members of the Pro Football Hall of Fame and America’s Wounded Warriors Project in a fun for all bowling event. Each bowler will receive a limited edition Super Bowl XLVIII commemorative bowling ball, pin and shirt. Participants as well as guests/spectators will be entitled to a “NY/NJ Neighborhood of Foods” buffet, soft drinks and auction. Entry fees for this event start at $200. 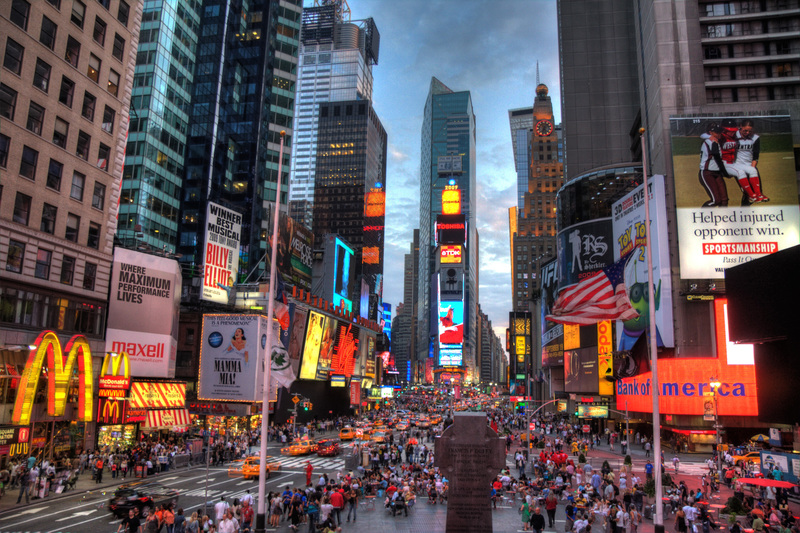 Starting on January 29th the “Crossroads of the World”, aka Times Square, closes down! 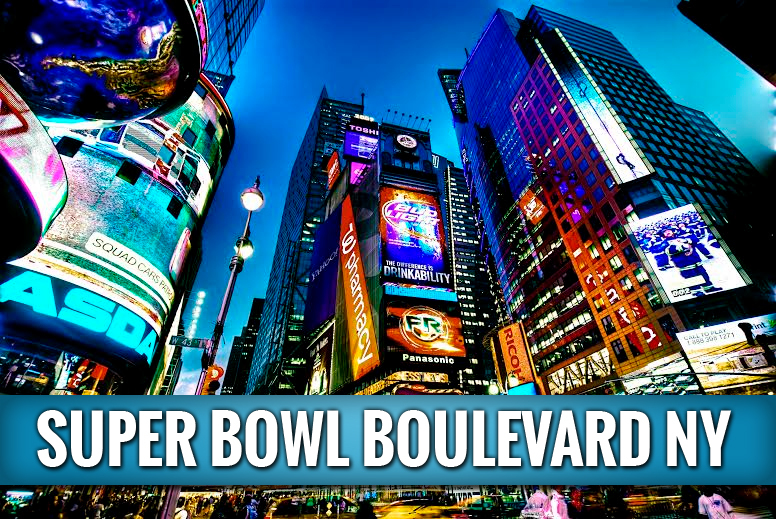 That’s right, from 34th St. up to 47th St. on Broadway, “The Great White Way” will be transformed into “Super Bowl Boulevard”. Beginning at Herald Square on 34th St. venues like the ‘Super Bowl Theater’ and the ‘NFL Rush Zone’ kick off the 13-block sports fan nirvana. On 40th St. from Noon to 5pm daily, the Autograph Stage will offer free autographs from NFL stars. Then at 8pm, the Concert Stage comes alive with some of the best talent New York has to offer. Throw on an extra layer, embrace the cold, and enjoy the show! Though photo ops will be around nearly every corner of NYC during Super Bowl Week, perhaps no one block will better serve as a perfect backdrop than that located between 43rd & 44th Streets on Broadway. 20-foot high lampposts with the Roman numerals of the previous forty-seven Super Bowls will be the perfect place to snap that picture for the photo album. The Vince Lombardi trophy will also be on display in the same area for fans to capture that once-in-a-lifetime opportunity with the trophy. At the northern end of Super Bowl Boulevard fans will get the chance to kick a field goal through actual NFL goalposts near the Fox Broadcast set. Other media outlets will have booths scattered through the area like CNN and the NFL Network. Every block of the Broadway tribute to the NFL will be sponsored by companies such as McDonalds, M&Ms, XBoxOne, and more. -The Waldorf Astoria hosting the Super Bowl Friars Club Roast of Boomer Esiason on Thursday, January 30th. -The world-famous Apollo Theater celebrating Black History Month and Super Bowl Week with a two-night musical tribute event on Thursday the 30th and Friday the 31st. -Knicks and Nets NBA home games and Rangers, Islanders, Devils NHL home games throughout the week. And oh yeah, don’t forget that the actual Super Bowl game kicks off on Sunday evening (around 6 EST), February 2nd.